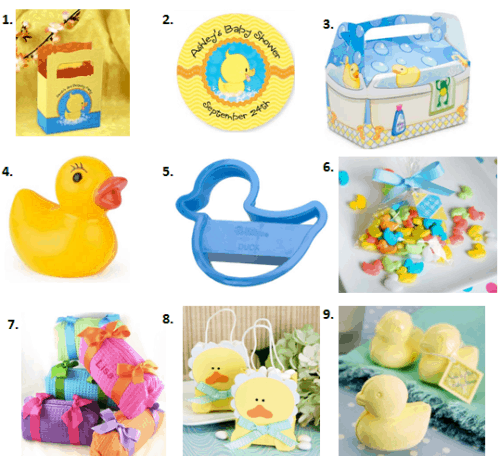 Yellow, blue, orange and white are all perfect colors for a ducky baby shower. You can incorporate these colors through table linens, dinnerware, balloons and flowers. There are super cute clear “bubble” balloons that you can purchase from your local party store. 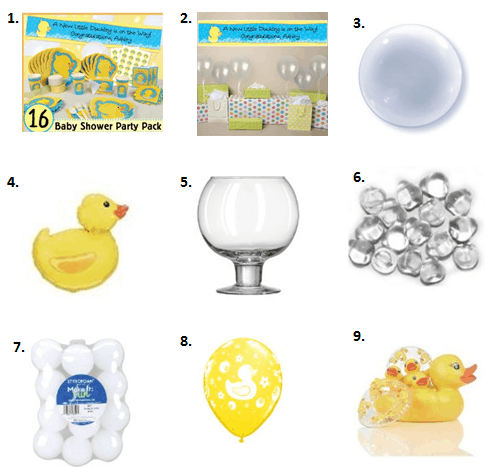 These help set the scene for a bubbly party area – perfect for little ducks! 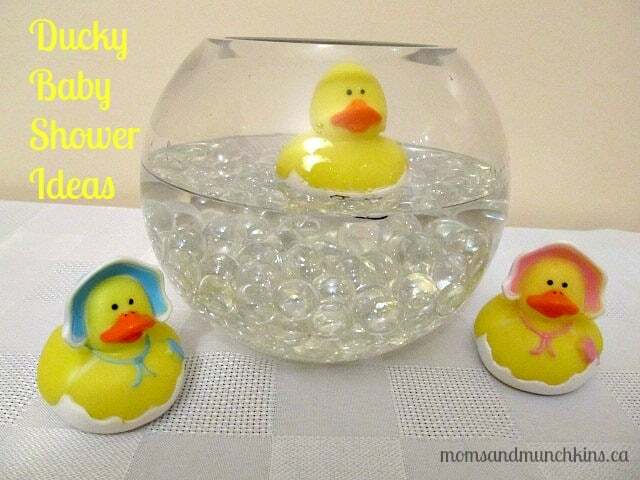 Other fun ideas include small round decorative bowls with clear decorative rocks in the bottom, filled with water and a rubber duck floating on the top (see the picture at the top of this post for a sample). Don’t want to use water in the centerpieces? You could also use small white Styrofoam balls in the bowl to give the look of bubbles. A simple game you can play is to let the guests know that one lucky person has a duck hidden under their seat. The lucky person with a duck under their seat wins a prize. Another simple idea is to place a bunch of rubber ducks in a small tub of water and ask each guest to pick out one duck. The person who chooses the duck with the special marking on the bottom of it could win a prize. 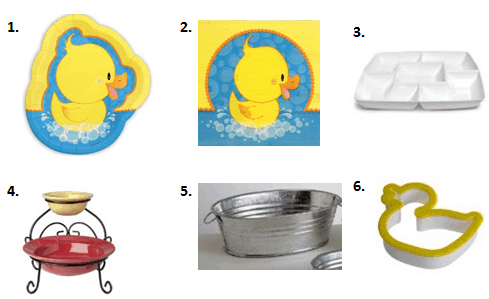 For a game where you don’t mind getting your party area a little messy (this would be great for an outdoor party), you could set up a game with a few rubber ducks, a bucket of water and a table area with some light baby items (such as bottles). The goal of the game would be to fill the duck with water, then try to squirt & knock down the bottles on the target table. You’ll want to have a few towels handy to clean up the water mess. If you’ll have kids participating in the ducky baby shower, they could play a game of Duck Duck Goose. This is an easy game where all the children sit around in a circle. One person walks around the outside of the circle tapping each child on the head and saying “Duck”. They then touch one person’s head and say “Goose” and that person has to jump up and run around the circle to sit back down in their spot. Whoever gets there first gets to sit and the person left standing is the next one to walk around saying “Duck Duck Goose”. Light finger food and appetizers are always popular at baby showers. My two favorite party dips are Hot Artichoke & Spinach Dip and Turkey Taco Dip. You can find the recipes for these (and others) here on the recipes page. How do you feel about games at a baby shower? Do you like playing them or would you rather sit back & relax? We’re always sharing new creative ideas for parties. Never miss an update by following us on Facebook, Twitter, Pinterest and Bloglovin’. *Disclosure: I am part of the Big Dot of Happiness, Amazon, Birthday in a Box, Beau-coup and Tiny Prints Inc. affiliate programs. All opinions expressed here are 100% my own. Amazing idea for a ducky baby shower. I’m 10 and I’m planning a baby shower for my stepmum. Will definately use some of these ideas! Glad you found us – and good luck with the baby shower!